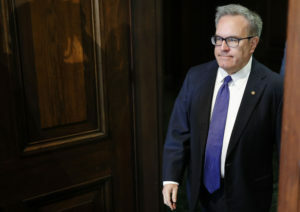 WASHINGTON — Andrew Wheeler, a former lobbyist who has led the Environmental Protection Agency since his scandal-plagued predecessor resigned earlier this year, got President Donald Trump’s nod Friday for the permanent job. Trump made the announcement almost in passing at a White House ceremony for Presidential Medal of Freedom honorees. READ MORE: Who is Andrew Wheeler, the acting EPA administrator? Wheeler has served as the EPA’s acting head since July, when then-EPA administrator Scott Pruitt resigned amid ethics scandals. A former lobbyist for coal and other industries, Wheeler has a reputation as a methodical steward of the Trump administration’s deregulatory mission. Wheeler was confirmed by the Senate 53-45 as the agency’s deputy administrator last April.